1. 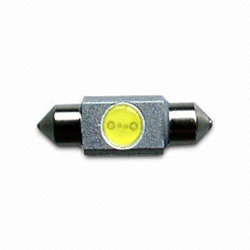 Automotive LED bulb with 12V DC voltage and low power consumption. 5. High shock or vibration resistant. 6. Built-in current limiting resistors. 7. Long life: >50,000 hours. 8. Designed to work in negative ground vehicles. 13. Lamp warranty: 1 year. 1. Base type: TJ31. 2. Power: 1W/ 1.5W. 3. Supply voltage: 12V DC. 4. Luminous flux: 40/ 60lm. 5. Emitting angle: 180°. 6. Material: aluminum. 7. Net weight: 7g/ pc. 8. Packaging: plastic shell or static-free. 9. Colors available: white, red, yellow, blue and green. 10. Applications: automobiles or aircrafts, automobiles signals, recreation vehicles, trucks or trailers, marine vehicles or boats, and motorbikes.